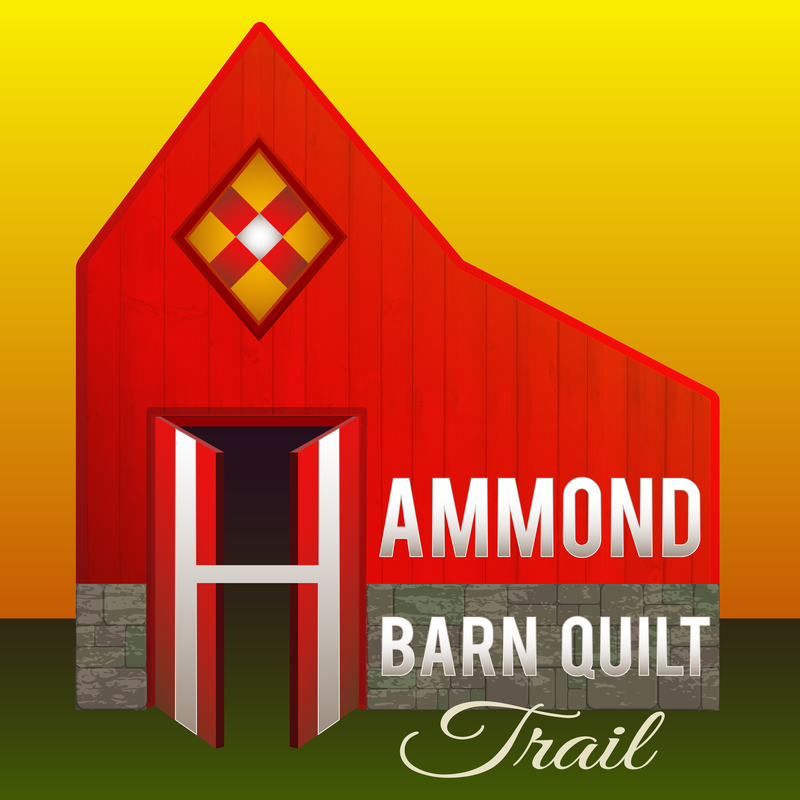 Welcome to Hammond’s Barn Quilt Trail — Honoring Hammond’s quilting and agricultural heritage! Barn quilts and barn quilt trails are the creation of Donna Sue Groves of Adams County, Ohio. Donna had long wanted to honor her mother’s skill and love of quilting and envisioned a sampler of quilt squares created along a driving trail that would invite visitors to travel through the countryside. This simple idea has since spread across the country by quilt guilds, civic groups, local arts councils and others who have been inspired to bring the beauty and community involvement of a barn quilt trail to their own communities. Hammond’s trail grew out of conversations among some community residents starting in 2013, and began in earnest in July 2014, when the conversations turned into a commitment by a small group to the creation of the first barn quilt trail in St. Lawrence County. This committee made presentations to both the Town and the Village of Hammond Boards and was delighted to gain their support. Each Board voted to commission a barn quilt, and the Town made workspace available in the basement of the Town Hall for the quilt square painting to take place. We also presented the idea to the Hammond Museum and were very gratified to gain their support. The Museum Board members took on the task of creating a barn quilt themselves, and have been extremely generous in sharing their facilities for promotion of the trail. We created a Facebook page to share our excitement in June 2014; we held our first workshop in September; and we have spent much time and effort in researching recommended guidelines for creating the squares, reaching out to residents and business owners with information and support, and discovering and handling the many other details involved in organizing the project. Since 2015, we have provided over 30 beautiful barn quilts to be viewed. Each year we continue to hang more barn quilts. We also have a new theme each year to keep our trail full of surprises. Here is a list of some of our themes. The committee is very grateful to Hammond’s government and civic organizations for their support, and most especially to the citizens of Hammond who have taken this project to heart for the love and beauty of our town. We’re a volunteer community group developing a Barn Quilt Trail in Hammond. Our special community is located in Northern New York, in St. Lawrence County — proudly situated between the breathtaking St. Lawrence River and scenic Black Lake. We invite you to experience our heritage (and tour our creativity) first hand by visiting our barn quilt trail. "Explore Our Shores!"